In the past 3-4 days, FKLI have managed averagely >10pts climb a day, every day, to bring us past 3 significant fibo levels since start of this week. Last Friday (Dec 07), FKLI close the week at 1,615. Taking today's early morning spike to 1,657.5, we have climbed a total of 42.5 points over three trading days. The bullishness is no doubt impressive, but it's way overdone without some decent pullback, the worrisome part of the strong rally. 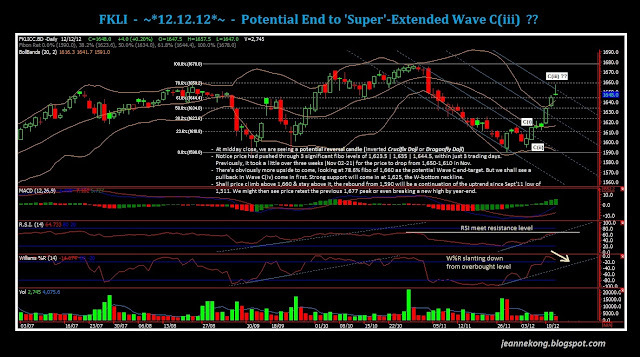 The current Wave C(iii), extended to 1,630, extended again to 1,644.5, & triple-extended this morning to 1,657.5. I'd really like to see some pullback from here, since we have a potential reversal pattern for today. A nice pullback will be crucial if the current rally is to continue, maybe to retest the previous peak of 1,677, or even, close the year with a new high on the index. Or, we might be affected by the US market, if the Congress still is not able to come out with a solution soon enough, to avoid falling over the Fiscal Cliff. So, it's still early to call this the end of the previous corrective donwtrend of 1,677-1,590, while it's also still early to call this a continuation of the long-term rally from 1,310 bottom since Sept'11. We will have to wait & see, whether the year will close on a bullish or bearish note. Here's my analysis at midday close. Enjoy the once in a lifetime 12.12.12 !!! I been trade KLSE for 1 and half years mostly based on Technical Analysis, thinking of moving into future too..mind share your experience abt the difference between stock and future? Yup. Traders are few here, at least those who show up is few. We should form a group or something to share trading ideas, that's also one of the reasons I'm having this blog. Start some paper trade on FKLI, u shall find technicals more useful here than in the manipulated stock counters. This Dec window-dressing rally has rendered the mathematical indicators 'paralyzed'. Traders shall go back to the basics, focus on using classical TA (trendlines, chart & candlestick patterns), if we are to ride along with the sharks on this manipulated rally. a reversal pattern on the daily. "We should form a group or something to share trading idea" i like this! Anyway, wonder why you choose to trade FKLI since malaysia market is highly manipulated? Every market is manipulated. Only that the Malaysia Boleh! spirit makes our market here even more 'well-controlled' by the local funds. However, local funds hardly touch the FKLI. They stay only in the equities market. Market manipulation is ever-existence, we can only familiarize ourselves swimming among the sharks. If possible, we can learn from the nature, we be that little fish which feed from sharks preys leftovers, benefiting from the natural symbiosis relationship.